This is the ultimate summer dinner because anything that you can make on the outside BBQ during the heat is definitely tops in my book. When I buy whole salmon I like to cut off and save the tail and head and boil them for an excellent and easy fish sauce that you can freeze for later use. Blend all of the dill sauce ingredients together and let it chill in the fridge while the salmon is cooking. Rinse the salmon under cool water and then pat dry. Place 3 lemon wheels in the center of your tinfoil for the salmon to lay on. Sprinkle inside and out with salt & pepper and then stuff salmon cavity with lemon wheels, dill sprigs and garlic. Lay final 3 lemon wheels across the top of the salmon (so fish is resting on lemon even after flipped). 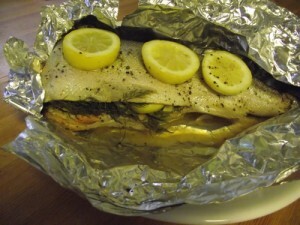 Wrap in foil and cook on medium heat for about 10 minutes per pound or until cooked to your preference. When salmon is cooked remove stuffing and then gently remove spine from the salmon. Serve with fresh lemon, a nice grilled veggie salad and cold creamy dill sauce. YUM!